Looking for a fun, affordable alternative to the standard “birthday” party? Well, look no further! 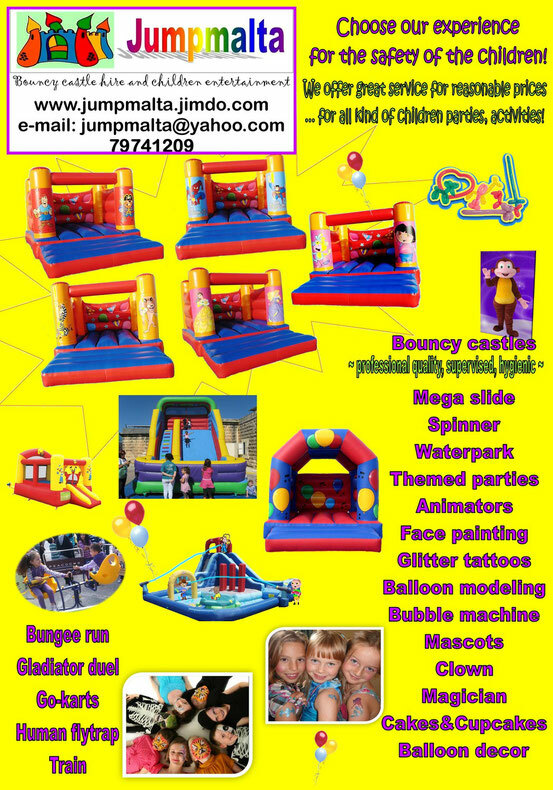 Jumpmalta Children Entertainment loves creating ‘out of the box’ original parties and events for every day celebrations! Although we do not shy away from commercial themes, we pride ourselves on originality, and creating something new and exciting for our clients. We understand that not everyone can afford to do extravagant celebrations for their loved ones! We provide budgeted party plans and ideas for how to have affordable & adorable parties! We plan your celebration to detail, and create something unique and special that’s personalized to each individual’s needs! Engaging us to take care of your child’s birthday party or corporate event will ensure a smooth running experience on the special day, a super fun experience for all little party guests and a stress free occasion for mums, dads and event organizers. Likewise all our clients enjoy the professionalism of our friendly, responsive, super friendly staff & incredible children entertainers. Having been one of the leading children entertainment companies on the Maltese Islands since 2007, our repeat bookings and word of mouth referrals are a true testament to the quality of entertainment we provide. Our expertly managed team structure means that we are well equipped to cater for large events whilst being passionately focused on the finer details required to ensure all our kids birthday party bookings are completed to the highest standard possible. Our face painters, glitter tattooers, balloon modelers are all qualified and continously trained!